Lestrade viewers were manufactured in France using plastic from about 1954. They were available in a number of different colours, the two most common being green and red. They take a card that has ten stereo pairs and that generally have good quality pictures and realistic stereo depth. 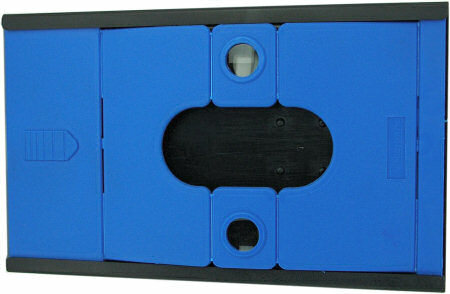 The slides can be differentiated from Stereoclic slides by their set of double sprocket holes between the pictures (Stereoclic slides only have one sprocket hole per picture). 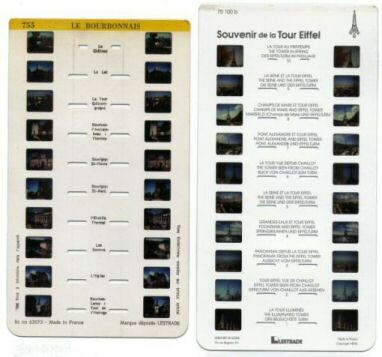 Lestrade slides are primarily geographic in nature, although there is a small range of children's subjects, as well as sets of cards entitled "Etudes de Plastiques" which are of nudes. This viewer is made from bakelite and is riveted together. It is heavier than the later plastic variety and the slide advance mechanism is made from heavier gauge metal. 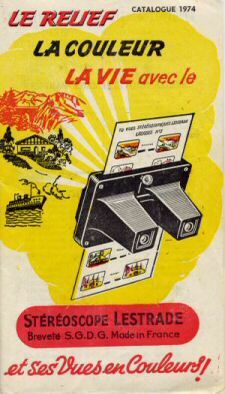 This causes more wear on slides than the later plastic variety of viewer pictured below. This early style bakelite Lestrade viewer is quite uncommon and commands a considerably higher price than the later plastic Simplex variants. Earlier Lestrade viewers used rivets to hold the body together. It is possible, if great care is taken, to remove these rivets for internal repair and cleaning. 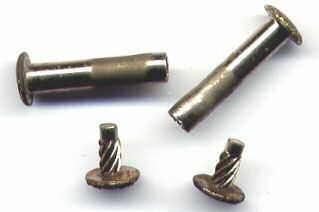 The small end of the rivet is actually a screw and unscrews counter-clockwise. The viewer below has an all metal advance mechanism and lever, however, unlike the viewer above the body is made from plastic. The body is held together using screws. 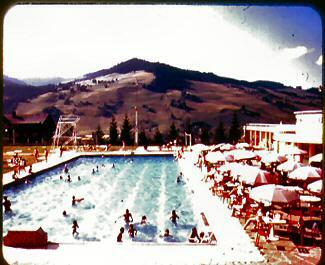 It dates to around 1958. 1958 Model with metal advance lever and screw together construction. 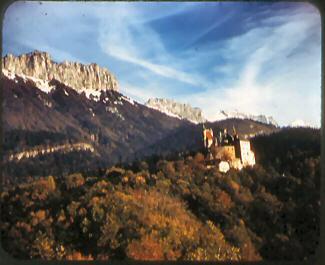 The viewer on the right is the older of the two, dated at around 1968, the one on the left dates to the mid to late 1970's. 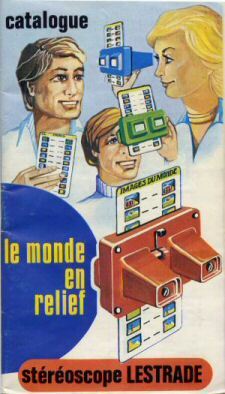 The green right-hand viewer screws together and has a plastic advance lever, the newer red viewer just snaps together. Notice the subtle differences in the light apertures and lens surrounds. This is the top of the range Lestrade viewer and can be focused. The focusing lever can be seen between the eye-pieces and is moved from left to right. The viewer gives a superb, clear image which is significantly enlarged when compared to the standard viewer. The body of the viewer is about 1.5cm wider than those shown above. This model is relatively uncommon and so fetches a reasonably high price at auction. 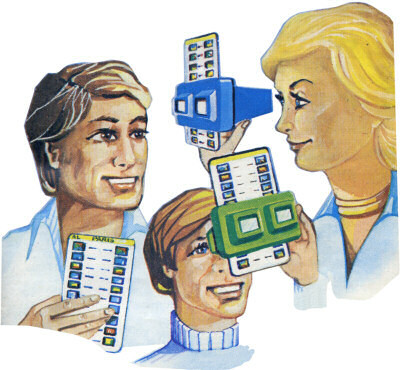 An older version of the Suprex Viewer. Notice the completely different advance mechanism. The entire advance knob, lever and slide advance plate are all made from metal. In the newer version they are all made from plastic. The focusing lever is red on the earlier model. A simple but very effective Lestrade Folding viewer. The card is manually inserted into a slot at the bottom of the viewer and then pushed upwards, frame by frame. 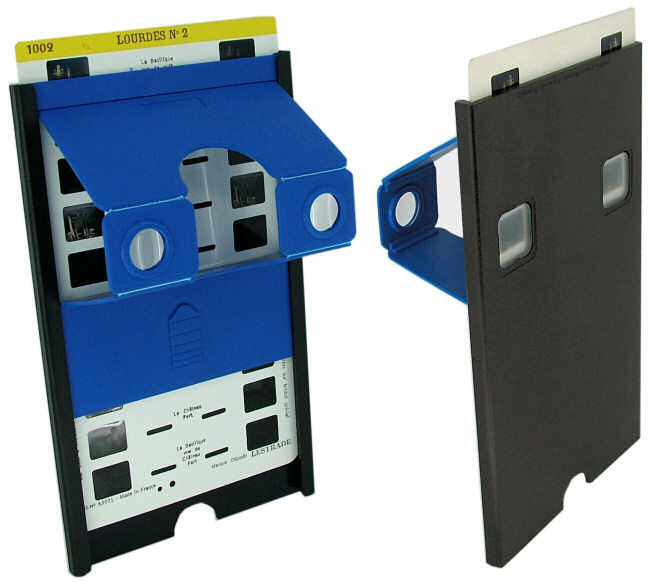 Despite the simple appearance of this viewer if is excellent to use and gives very clear and bright images. When folded into it's flat position is is only 8mm thick.